Tom Ford presents an aesthetically sharp yet artistically hollow story which is more character-study than a possible commentary on the epoch it is written for. Mr. Ford’s designer aesthetic is much more viscerally displayed in this work compared to A Single Man, as he has provided himself bountiful opportunities to craft the cinematic plane to present supra-photographic moments, images which would be more relevantly found in an art photography gallery. Yet cinema is not simply motion pictures. The motion of those pictures must draw us into perceiving an unseen order about the reality we are subjected to. Mr. Ford does shed some light on one, tucked away aspect of society. But I do not refer to his self-deprecating exhibition of the commercial art world and its pageantry of philanthropy; and the intertwined ridiculous professional networks of what can only be described as restless strivers for social status. Mr. Ford very demurely yet exquisitely exposes the inner secret to this class – notably gated on the island of Manhattan but also in the hills of Hollywood – and it is an existential anxiety which is quelled by a sense of certainty, of knowing one’s place in the world by virtue of the black cars that whisk them to toiling away at preserving their rung on the social ladder. These are a thoughtless people, who have no aristocratic pretense for the basis of leisure, who see universities as branded luxury to tote around town. Yet we do not have this beautifully depicted center of gravity attract the body of the film, which is a story-within-a-story about a gruesome south Texan calamity written as a manuscript by the lead character’s ex-husband. Disregarding the irony found in a hysterically fearsome treatment of fly-over land with the manuscript, there is no connection between the anxieties of strivers with the gruesomeness in the novel other than a very thin line drawn between the author’s incapacity to “hustle” which was the downfall of the relationship in the first place. This is perhaps zestful screenwriting for a female audience – to involve oneself within the subtext of an entire novel which is a metaphor for the entire relationship’s history. But beyond a voyeuristic indulgence, the plotline in the manuscript is superfluous to the actual world in the film. Are we to suppose that the author is plain guilty for being inadequate to keep up with his striving ex-wife? Does she feel guilty that she became her mother, a miserable person shackled to her material status? Such a woman would not have been happy in either life –struggling with an artist nor struggling with a social striver. There always is this wishful thinking that never extinguishes the acid rain which erodes ephemeral pleasantness. Granted, she may feel self-resentment for being so attached to her status, but again, the answer to happiness can never be found in hindsight on an impossible timeline of history. It is found in the present and its conscientious construction in the future. Regardless, Nocturnal Animals feels genuinely like a male homosexual fashion designer playing with dolls, particularly offensively with the male heterosexual character writing. If there is any empirical testimony to the naturalness of homosexuality it is found in this film’s treatment of straight men, in how alien to Mr. Ford the male heterosexual mind is with its diction. Writing, though, does not need to be mastered by Mr. Ford, as he is presumably a visual mind. Promising movements forward with his filmmaking is this definitive comfort in cinematic sculpture, i.e. in depicting scenes which are keenly magnificently striking yet have no literal context other than their sheer rhapsody. 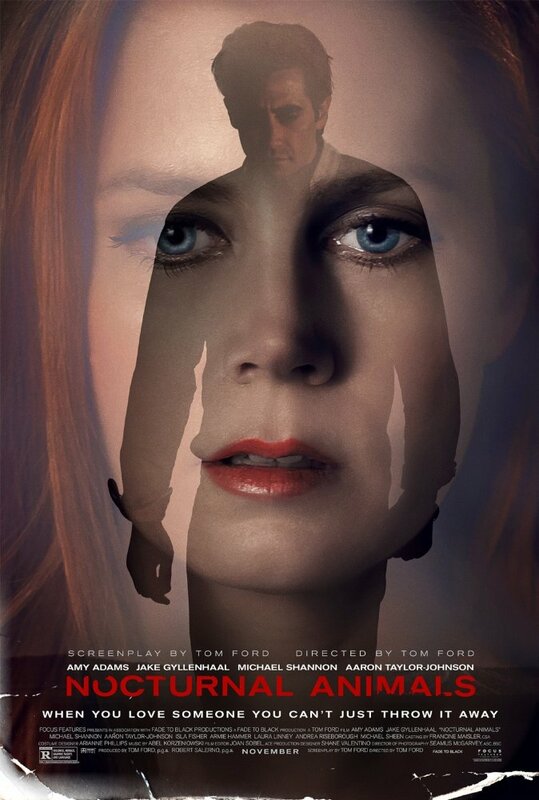 A true evolutionary moment is in his filming of lead actress Ms. Amy Adams’ eye as she connects the dots about a missed dinner date. This captured motion transcended the story and evoked, if ever briefly, a Terrence Malik reminiscence. I no doubt am confident Mr. Ford possesses such radical filmmaking style, where the plot is ethereal and he does not feel constrained to chronology in stereotypical filmmaking, wherein the visual itself is more important to impress upon the audience than the story. So it was pleasant to see his evolution as a filmmaker and recommended viewing for those who are fans.